Many Oregon roadways are busy blurs, but this week, slow down and enjoy the sights and sounds of the changing seasons. This getaway takes us down the country’s oldest national scenic byway in the Cascade Mountains. If the roadway flanking the South Fork McKenzie River has a number, I don’t care to find it on a map. That’s because I’ve such a love affair with this byway that takes a bit longer getting from this place to that. 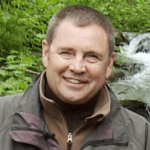 The best place to start is the McKenzie River Ranger District office at McKenzie Bridge, Oregon, where you can pick up an audio CD that accompanies the Robert Aufderheide Memorial Drive portion of the West Cascades Scenic Byway. This drive parallels both the South Fork of the McKenzie River and the North Fork of the Willamette River, with views to cascading streams and large, old growth Douglas fir trees. The paved, two-lane road ranges in elevation from 1,052 to 3,728 feet, with many turnouts for scenic viewing and access to outdoor recreation. The audio tour will lead you down a byway that rambles along for 60 miles, where countless feeder creeks trickle across spongy moss-covered rocks throughout the two river basins that are home to this drive. The drive can take two hours, an entire day, a never-lonesome week, or a lifetime, as there are campsites galore along the way. 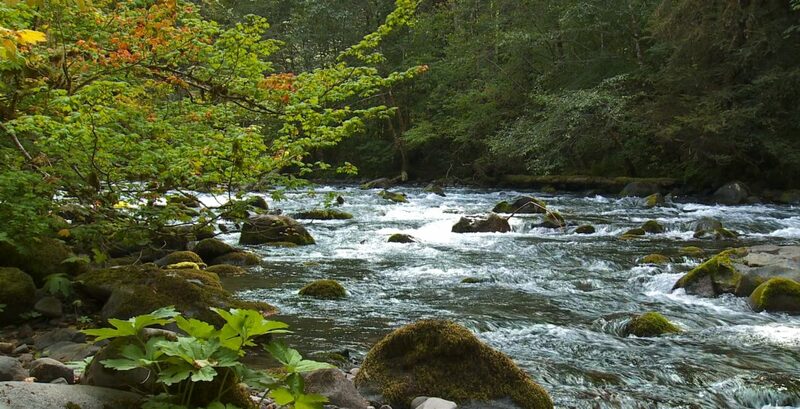 The South Fork of the McKenzie River is part of the National Wild and Scenic Rivers system and provides opportunities for catching rainbow and cutthroat trout. Watch for a roadside replica of an old log station near the summit of the drive, while just across the street you will find a monument to Robert Aufderheide’s memory. Aufderheide was a federal forester with vision who prized recreation, rivers and the little surprises that nature provides. It should come as no surprise that cyclists love this place too. Near the memorial, watch for the self-guided trail that leads you through stunning Constitution Grove. It’s a grove of old growth trees named by the US Forest Service in celebration of the signing of the Constitution’s 200th anniversary in July of 1987. That’s significant because many of the trees in the grove are more than 200 years old. Soon, you’ve reached the North Fork of the Willamette River, a stream that holds surprises at this time of year and is worth a second look. Watch for the husky salmon that have muscled their way back to home waters. Driven by biology, the spawning fish are yet another sign that summer has passed and it’s now fall. But it is the colorful, wonderful show along this back road that I cherish the most; a chance to witness the changing colors of big leaf maples, mottled with brown or gray, whose leaves fall gently and glide past my way. 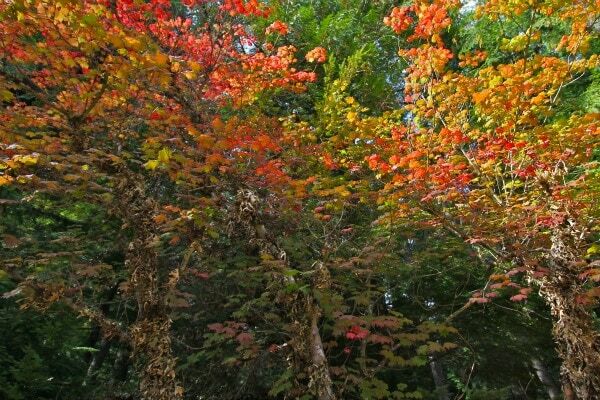 And oh, to be by an orange or red maple, the brightest of Oregon’s autumnal colors. At times, the fallen leaves collect in mountainous piles along the roadway. The cap to this day-long adventure is the short drive through the long bridge at West Fir, Oregon. 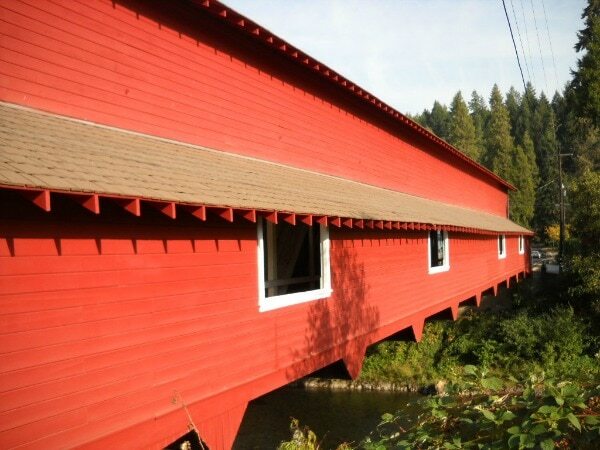 At 180 feet, Office Bridge is the longest covered bridge in Oregon and marks the end of the drive. It’s a roadway whose prime time is passing, so hurry soon to slow down on a back road without a number one of the very best around.